Let me just get this bias out of the way. I am a huge New York Knicks fan. That being said I am also a big Lebron James hater. I despise the man as a player and loathe all of the love and attention he receives from the media. I get joy out of booing Lebron when he comes to Madison Square Garden and am always happy to see when he fails in the playoffs. That being said I have to give major kudos to director Judd Apatow and writer/star Amy Schumer for making Lebron James likable to me in their film Trainwreck. That alone would be a huge accomplishment for any movie, but Trainwreck is a very good film beyond the fact it made me waver on my personal bias towards Lebron. This is a great opportunity for Amy Schumer to show off her skills as a screenwriter and leading lady and she excels at both with Trainwreck as her vehicle to announce her big screen arrival. What Bridesmaids (2011) did for Kristin Wiig, Trainwreck will do for Amy Schumer. 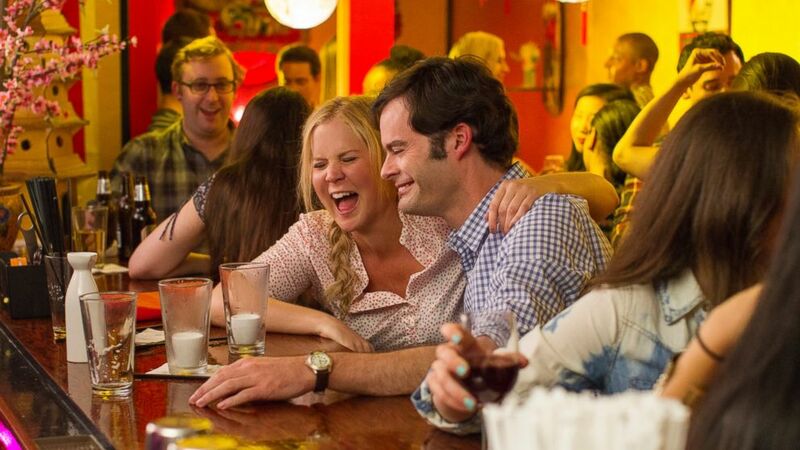 Make no mistake; Trainwreck is a funny and frank depiction of females dating in the twenty-first century. Its candid depiction of female sexuality is not the norm and I found that to be invigorating and bold. The main character Amy (played by Amy Schumer, so clever) is very open and in control of her sexuality, women in mainstream movies are usually punished for this type of behavior on film, instead Trainwreck treats it as is neither praising nor condemning her actions. We see Amy dealing with the pressures from society (mainly from other females) that she needs to get married and have children otherwise she is looked at as a failure. Amy Schumer deals with these real life criticisms women in her characters situation face in very humorous ways. A flawed, single 33-year-old female as the films lead character is refreshing. The results are often funny and always honest which makes this film more emotional once you get involved with the story and characters. It reminded me a lot of the romantic comedy Enough Said (2013) where you saw a female act in ways that men usually do in romantic comedies instead of being righteous or the perpetual victim. This has a lot of the strength’s of that film, just written for a younger demographic. Speaking of its target audience, I mentioned Lebron James playing himself and how well he was utilized in Trainwreck. Other athletes also pop up in the movie and they do fine in their supporting roles as well. John Cena really stood out in the movie as a guy Amy was dating where he was really into her and there just was not any spark or chemistry. Amare Stoudamire also did very well as himself and his subplot involved having to go under the knife and have surgery on his knees (as any Knicks fan would know this is very appropriate and realistic). The surgical operation was to be done by Bill Hader’s character, a sports physician Amy Schumer gets involved with in the movie. These athletes were cast because this movie is very female-centric and I think Judd Apatow and Amy Schumer were smart to throw these athletes into the movie to keep its male audience interested. As I praise the athlete’s performances I cannot neglect the great performances across the board by the real actors. Amy Schumer proves that she is a force to be reckoned with pulling double duty as actress and screenwriter and I really hope that come awards season she gets recognized for her great work in this film in both the writing and acting awards. Bill Hader gives his most tender screen performance as her jilted lover and boyfriend trying to navigate his way working out all of the relationship problems he has with Amy and trying to not let them effect him at work. This is a problem we have all dealt with and Hader makes the problems on screen seem very relatable. I also really enjoyed Colin Quinn as Amy’s cantankerous, yet lovable father. Quinn is not known much outside of being a stand up comedian, but after seeing him here I hope he gets offered more serio-comic roles because he shows he can handle it. Overall Trainwreck is a good film but has its flaws. The biggest being that it is too long. The first half hour features some sophomoric gags that I did not find funny and left me cold, but then once the movie gets going I really started to care about the characters and got sucked into the story. Even though I cared more about the characters as the story moved forward, the third act really dragged at times and a few scenes could have been trimmed. There were also some problems I had with the logistics of some of the characters job situations. Bill Hader seems to be THE doctor for all professional athletes and I found it very unrealistic that one character got fired from a job at a great magazine only to immediately find employment at another even better magazine. Despite those elements I found to be too far fetched from an otherwise honest and realistic comedy, Trainwreck is worth it and melds tender and kindhearted with vulgar and crude humor into an undeniably funny movie.